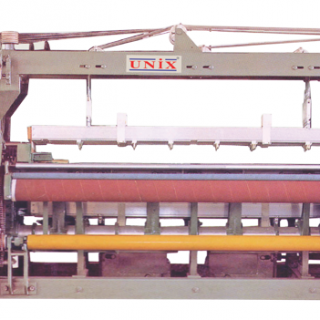 Rapier Loom – UNIX Stitch Machines Pvt. Ltd.
Wefting device adopts 6-connecting-rod wefting structure and can ensure the adjustment of the rapier entry and exit time and ensure stable wefting and weft connection. This machine adopts 4 connecting rods, short connectors and short reed seat to complete the beating motion, the rocker shaft adopts  110mm seamless tube to ensure the beating strength and can be suitable for high-speed motion and weaving of heavy and high density fabrics. The rapier transmission box adopts the advanced helix umbrella gears to ensure stable transmission. The tension device adopts 3-rear-beam tension structure, which is specially designed for balancing the warp tension of high-density weaving and can improve the quality of the weaving fabrics.